Analysis for the River water and the bed of sludge. Finalizing and disposing of all types of Heavy metals, (including Arsenic), as well as Cyanide, Sulfate and biological sludge. Allow the reuse of the River water for irrigation, cooking, drinking and all the water needs of the people living in the areas of the Contaminated River. P2W will clear all the existing pollution in the places along the River Banks where there is pollution activity, thus effectively set up P2W plants to deal with the contaminated streams. Our proposal is to do a fast River study with Eco Sound equipment and we will do 3 long run they will get all the it can take 7 to 10 days for each 100 Km of the River depend on the length and width of the River and. Following the Eco Sound Survey (or in Parallel) we will take samples of the sludge from the River bed. 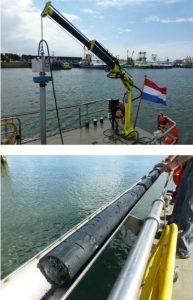 The sampling is more complicated, since it requires using modern equipment Fibrocore that can ledge layer and take samples by vacuum. We take for example 3 samples every 1000m. We will get 300 samples for 100km and this will take about 45 to 60 days. We will need a small boat with a crane to lift the Fibro coil tool that weighs around 100kg. The analysis fiscally and chemically by local laboratory will take also in parallel in 45 to 60 days. 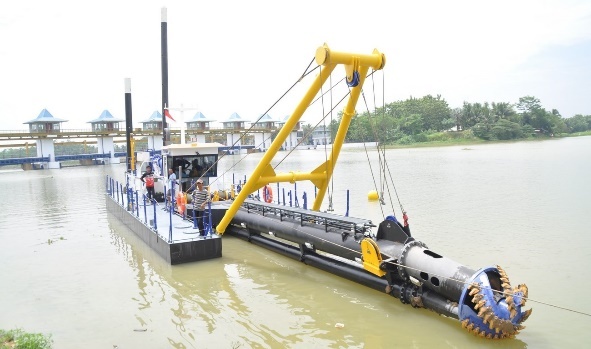 All of the above will enable us to choose the right Dredging equipment and the methods .We have large verity of dredging ships from 3000m3 storage capacity to an 18,000m3. We have the cutter system and the Grub system (1-5m3). We do a lot of dewatering and bring it to the shore to an open storages along the River (We call it Depot) and then we dry it and maneuver it to a center processing plant and recover the soil for other utilizations. We intend to begin dredging at the River outlet from ocean point and go upstream. 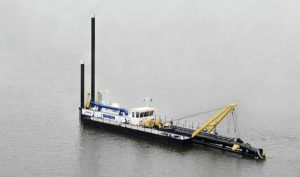 We will start with one set of dredging equipment and will increase to 5 parallel operating Dredging teams accordingly. At this point in time we don’t know the River width and length, and the average thickness of the sludge layer is around so all together we expect to treat approximately millions m3 of sludge at stage one. We intend to install 5 dredging pontoons that will be mobilized via sea (or other routes if needed). In places that are not accessible for large dredging ships we will bring units that can be disassembled into container units. This will enable us to mobilize the units easily if we encounter obstacles (i.e. rocks or water falls etc.) to the next landing site along the River. We assume that we equip the first pontoon with Modular Cutter Dredger that will bring the sludge onto the second Pontoon that will be equipped with special screening set to screen the important metals fraction from the sludge. A powerful pump will pump the sludge from the second pontoon to a designated area on the River banks up to a distance of 3 km. In this area the sludge and water will treated and converted to useful aggregate. A special designed pontoon will be equipped with a grub crane to enable removal of rocks, stones and any other obstacles that will prevent continuous treatment of the water. Production is based on pumping fine slurry material. The sludge will be pumped to the shore through a pipeline.